The perfect spot to stop time and unwind!! 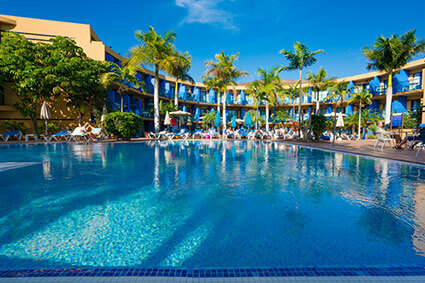 Blue Sea Jandía Luz 2* is located at the southern tip of the island of Fuerteventura, in Playa Jandía. It belongs to Morro Jable, a small town in the municipality of Pájara, which is considered one of the most touristic places on the island. It has wide beaches where one can relax with the family and surfers can chase the impressive waves. Fuerteventura has a warm climate which makes it suitable to visit it at any time of the year. Playa Jandía in Morro Jable is a volcanic peninsula shaped like a half moon. It is a unique place where one can disconnect from the routine. It offers you an infinity of corners where you can relax, listening to the sound of the sea breeze and admiring the spectacular landscapes. The beaches are also perfect for surfing. Jandía is one of the most sought after locations in Fuerteventura. The immensity of its beaches and its attractiveness, make it the perfect destination for both family and couple holidays. Its small coastal port is connected to the island of Gran Canaria and the trip takes around two hours. Fuerteventura has a lot to offer to tourists. Virgin beaches such as Morro Jable or Copete, excursions to the Jandía Natural Park, El Pico de Zarza. The delights of the Canarian cuisine such as potatoes with mojo, gofio, the Canarian puchero and of course the majorero cheese and the frangollo. Prepárate para descubrir Playa Jandía con Blue Sea Jandía Luz *! Stay at Blue Sea Jandía Luz and discover Fuerteventura, one of the wildest and most attractive islands of the Canarian archipelago. It has a great diversity of landscapes and protected areas such as the Jandía Natural Park or the Pizo de la Zarza, from where you enjoy the magnificent views of the Mirador Degollada Agua Oveja. Jandía has a special charm. It boasts of offering its visitors fun, entertainment and a very varied cuisine. In Jandía you will be able to taste the typical gastronomy of the region, such as ‘potatoes with mojo’ which is the most traditional Canarian dish of the region, followed by ‘gofio’ and the Canarian ‘puchero’. Cheese lovers cannot miss the ‘majorero’ cheese and the ‘frangollo’. In addition, apart from its wonderful beaches, Fuerteventura and Playa Jandía offer you a wide range of leisure opportunities such as walking the streets of its pretty villages, exploring its shops and businesses, or visiting its amazing landscapes. It is located in the peninsula of Jandía, it is considered the beach of one’s dreams, a virgin paradise, a beach of fine golden sand, more than 10km long and found amongst the territory of the Natural Park of Jandía. Surrounded by mountains, with a low occupancy, it is the ideal place to unwind and admire the wonderful views of the Atlantic. Located on the peninsula of Jandía, in the south of Fuerteventura, Playa de Sotavento is a desert beach of fine golden sand with crystal clear waters and an explosion of colors that make it unique. Sotavento is almost 10 km long, and is well known for being the ideal spot for the initiation of water sports such as surfing, kite surfing or windsurfing. An oasis in the middle of the desert, this beach is considered one of the best beaches in Europe. It stretches for more than two kilometers and is characterized by its white sand, crystal clear waters, and surrounding palm trees. Fully unwind in this calm coast, a place with a lot of atmosphere in the summer and with ‘chiringuitos’ (small drink bars) on the same beach as well as plenty of restaurants in the surrounding town. During the month of June the festival of San Juan is celebrated around the beautiful virgin beaches of Cofete. Fire and magic come together in the Natural Park of Jandía, where locals dress up in traditional costumes from the Canarian culture. This is an event which you can not miss! For over 30 years, the Windsurfing and Kiteboarding World Championship has been held in Costa Calma the During the month of July. It lasts until the beginning of August and the very best professionals take participate in these competitions. The lighthouse of Morro Jable is located on the long beach of Sotavento. It is found in the area of Playa del Matorral, a natural space of 115.6 hectares and protected with the purpose of conserving the coastal ecosystem. This is a trip which you cannot miss on your visit to Fuerteventura. Its flora and fauna has immense endemics as well as protected species. You will find and untouched, impressive landscape, full of natural elements of great value. The Natural Park of Jandía is considered one of the most precious places within the nature of the Canary Islands. The beaches of Jandía are a natural paradise for wind sports. The size of its waves, its geography and the perfect winds make this place a real paradise for surfing, windsurfing and kite surfing, among many other wind sports. If you are an expert, we recommend the following surf sports in Fuerteventura. In the north of the island the best locations are Corralejo, Los Lobos, El Muelle or the Rocky Point, where the waves can reach a good size if the conditions are adequate.